MoneySavingExpert.com has seen another, even more disingenuous letter sent by Npower that purports to be from an external debt recovery firm. Earlier this week we revealed how a former Npower customer received a final demand from 'Collections Direct' 16 months after they'd switched away. The layout of the letter made it look like it was from an outside debt collector, although the small print at the foot revealed it was a trading name of Npower (see the We'll keep using fake debt firm to target customers, Npower says MSE News story). At the time Npower said its "letters clearly state that 'Collections Direct' is a trading name of Npower". But MoneySavingExpert.com has since seen a second, older letter sent by Npower, which doesn't say anywhere that Collections Direct is merely a trading name used by the energy firm. This is despite Npower telling us Collections Direct has always been an internal company that it's used for 10 years. The second letter also uses more misleading language than the first one we revealed, which strongly implies that Collections Direct is a separate, external firm. 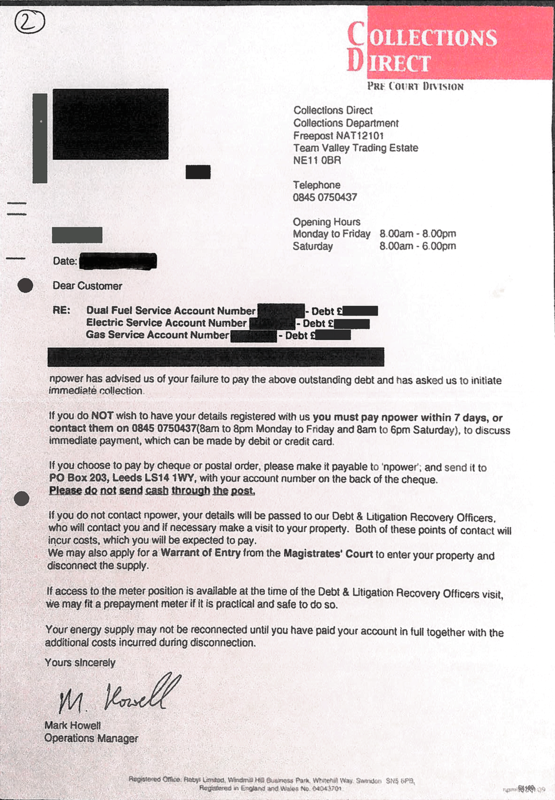 The letter states: "Npower has advised us of your failure to pay" and "has asked us to initiate immediate action". It adds: "If you do not wish to have your details registered with us you must pay Npower within 7 days". Npower says this second letter is "several years old and demonstrates precisely what improvements we have made". This letter was sent in 2009 as opposed to the first one we saw, which was sent last month. Npower told us it won't stop using the most recent version of the letter. It's the latest in a number of scandals Npower has been caught up in. Yesterday, charity Citizens Advice said it was the most complained about energy firm between January and March this year, while last month it was revealed that former customers received huge bill demands months after they'd switched provider (see the Npower late bill blunders MSE News story). Here's a copy of the latest Npower letter we've received (click to enlarge). Martin Lewis, founder and editor of MoneySavingExpert.com says: "It's time we all stood up and demanded honesty from companies. From the Student Loans Company, to Lloyds, Npower and to Wonga – these companies want to heighten fear of people already struggling to repay. "Enough is enough. Even those who haven't lied outright are using psychological tricks on people who are likely already vulnerable. "Fair enough if people owe them money, they have a right to ask for it back, yet that needs to be done with respect, transparency and humanity. If they don't, it's time they heard consumers roar. "Npower, while it has improved its more recent letters by at least having a footer that tells you this is just a trading brand, is still behaving disingenuously to its customers. Its track record is appalling and the galling thing is it refuses to stop using the letters. This makes it a firm many should think twice about before using." The use of misleading letters came to light after payday lender Wonga was told to pay £2.6m in compensation after it threatened borrowers with fake lawyers. MoneySavingExpert.com has also reported how HSBC, Lloyds, Halifax, NatWest and RBS have used letters that appeared to have come from independent solicitors, when they were actually from the banks themselves. On Tuesday, the Student Loans Company came under fire from the Government after it was found to have sent graduates letters purporting to be from a debt recovery firm called "Smith Lawson & Company". What should I do if a debt recovery firm is fake? If a company sends you a letter purporting to be from a debt recovery firm, you should first complain to this company. In this example you need to complain to Npower. Call 0800 316 9328 from a landline, or 0330 100 8628 from mobiles. Or write to: Npower Customer Relations, PO Box 97, Peterlee, SR8 9AP. If you're unhappy with the response you receive from the firm, see if it's registered with an independent ombudsman scheme and if so, refer your complaint to it. In Npower's case, you can take your complaint to the Ombudsman Services. An Npower spokesman says: "This letter is several years old and we can say with absolute certainty that this letter is not indicative of our current collections process. The letter was compliant with industry regulations of that time and Npower has complied with all subsequent regulatory changes since."